Nitrogen is abundantly available in nature and forms the basis for many valuable products, both natural and artificial. This requires a reaction known as "nitrogen fixation", whereby molecular nitrogen is split into two atoms of nitrogen that can then be connected to other elements like carbon or hydrogen. But performing nitrogen fixation to make ammonia on an industrial scale requires harsh conditions with very high temperature and pressure. EPFL scientists have now developed a uranium-based compound that allows nitrogen fixation to take place in ambient conditions. The work, published in Nature, forms a basis for the development of more efficient catalysts, while it highlights new concepts that can be expanded to metals beyond uranium. Despite being widely used, ammonia is not that easy to make. The main method for producing ammonia on an industrial level today is the Haber-Bosch process, which uses an iron-based catalyst and temperatures around 450oC and pressure of 300 bar—almost 300 times the pressure at sea level. The reason is that molecular nitrogen—as found in the air—does not react very easily with other elements. This makes nitrogen fixation a considerable challenge. Meanwhile, numerous microorganisms have adapted to perform nitrogen fixation under normal conditions and within the fragile confines of a cell. They do this by using enzymes whose biochemistry has inspired chemists for applications in industry. The lab of Marinella Mazzanti at EPFL synthesized a complex containing two uranium(III) ions and three potassium centers, held together by a nitride group and a flexible metalloligand framework. This system can bind nitrogen and split it in two in ambient, mild conditions by adding hydrogen and/or protons or carbon monoxide to the resulting nitrogen complex. As a result, the molecular nitrogen is cleaved, and bonds naturally with hydrogen and carbon. 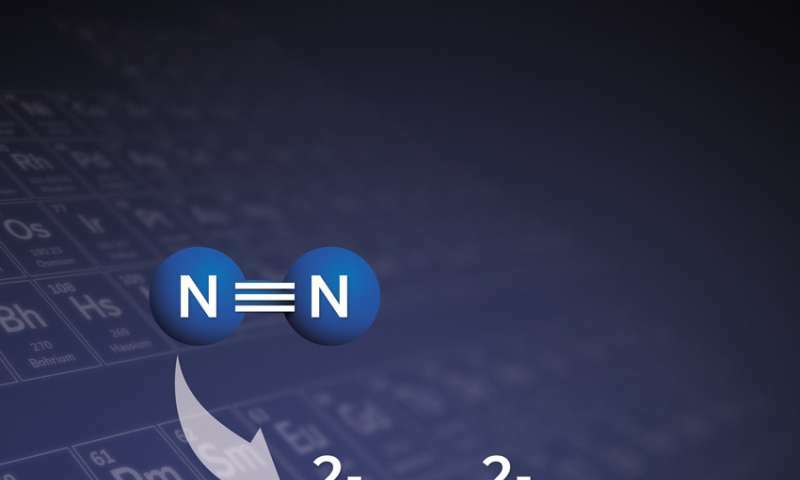 The study proves that a molecular uranium complex can transform molecular nitrogen into value-added compounds without the need for the harsh conditions of the Haber-Bosch process. It also opens the door for the synthesis of nitrogen compounds beyond ammonia, and forms the basis for developing catalytic processes for the production of nitrogen-containing organic molecules from molecular nitrogen.